The pound rallied against the Aussie dollar adding 7.6% in June! Experts view the drop in the Aussie dollar due to a combination of lower commodity and precious metals prices, risk aversion & stronger than expected UK economic data. Rates remained unchanged although in Australia there is a higher likelihood of a decrease in the coming quarters. Australia saw some strong economic figures last month with employment change increasing for the second consecutive month, showing an increase of +1.1K versus an expected decline of -9.8K. Unemployment also when down from 5.6% to 5.5% along with strong current account figures vs expectations. The key issue though are numbers such as Home Loans and GDP which are below forecasts. 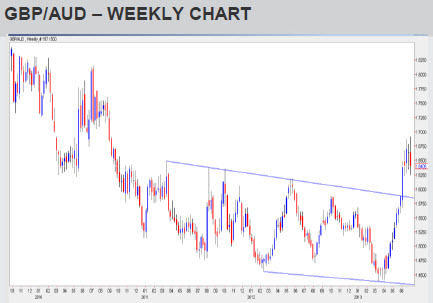 The combination of strong UK conditions and expected rate cuts in Australia provides conditions that may see the pound continue to appreciate against the Aussie dollar. Thank you Ozforex for providing background information used for this article.